Well, this is odd writing about news pertaining to myself, it is good news as the title extols. One day I received a call from AnimalHeroKids.org Director Shannon, also the mum of one of Animal Hero Kids seven-year-old Co-Presidents Evan. I said to her, “It’s a bright, beautiful day in paradise.” Unbeknownst to me at the time, she thought, “it’s about to get a lot brighter”… and it did. Imagine my surprise to find out the head of the global vegan franchise restaurant chain, Loving Hut, had heard about my almost four decades of work helping animals and had decided to give me a whopping great vote of confidence to continue it. 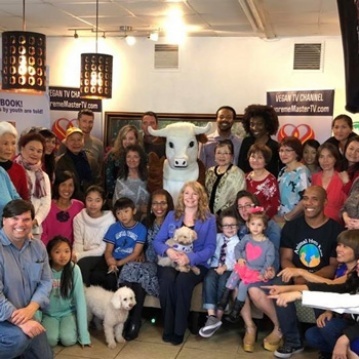 Shannon said the worldwide “VeganTV” channel wanted to do an interview about it and Loving Hut Market in Orlando would provide a feast for the presentation of the Shining World Leadership Award for Compassion, presented by Supreme Master Ching Hai International Foundation. The foundation representatives had asked Shannon to find out if the check should be made out to me personally or to Animal Hero Kids. “Animal Hero Kids, of course!” I replied. Loving Hut Market in Orlando provided superb vegan fare for the Shining World Leadership Award for Compassion presentation and “VeganTV” interview taping. Ronnie V Cow was mooooved by the generosity and kindness evidenced by all. Amazing Grace - an excerpt from the “Animal Hero Kids Voices for the Voiceless” book available at animalherokids.org Molli was 13 years old when she saw firsthand what happens to dairy cows. Her mum works at Gentle Barn, a sanctuary for some very fortunate farm animals who were rescued from the factory farming industry. Here’s Grace’s story in Molli’s own words. “When I first saw Gracie, I saw hurt and fear and anger. I saw someone who had been betrayed and treated with the most tremendous unkindness to the point where not one kind word or action could be taken to heart or understood. Whenever I tell Gracie’s story to anyone, their mouths drop open in aston ishment at how much pain she has been through, both physically and emotionally. It literally is hard for people to hear about how much pain and suffering could be inflicted on one being, but then they get to see that she seems to feel none of it now. Gracie seems happy, and everyone can tell. “Grace spent 12 years being impregnated and having her babies taken away each year. Grace had 10 babies taken away from her after they were born, so her milk could be sold for humans to drink. Then at the age of 12 she was bred to a very large bull that crippled her. Grace spent months trying to get up to no avail. She was about to be sent to slaughter when Gentle Barn intervened and brought her home instead. Gentle Barn staff and volunteers spent months treating her with massage therapy and chiropractic care until she could walk. Healing her body was relatively easy compared to what it would take to heal her heart. Grace had been disrespected by humans for so many years, she had lost all hope. At first we ensured that she had a lot of personal space, and then slowly we began talking to her, singing to her, petting her and feeding her treats. Eventually she began trusting us and became less angry, but there was still pain in her eyes. In California you will find Molli and Grace together at Gentle Barn any Sunday from 10 a.m.-2 p.m., teaching people kindness to animals, each other and the planet! How great it would be to have a similar sanctuary here in South Florida where school children could visit rescued farm animals and enjoy vegan fare. AnimalHeroKids.org is on the lookout for donated property to make this happen.